was a Russian Soviet poet, playwright, artist, and actor. During his early, pre-Revolution period leading into 1917, Mayakovsky became renowned as a prominent figure of the Russian Futurist movement, being among the signers of the Futurist manifesto, A Slap in the Face of Public Taste (1913), and authoring poems such as A Cloud in Trousers (1915) and Backbone Flute (1916). Mayakovsky produced a large and diverse body of work during the course of his career: he wrote poems, wrote and directed plays, appeared in films, edited the art journal LEF, and created agitprop posters in support of the Communist Party during the Russian Civil War. Though Mayakovsky’s work regularly demonstrated ideological and patriotic support for the ideology of the Communist Party and a strong admiration of Vladimir Lenin, Mayakovsky’s relationship with the Soviet state was always complex and often tumultuous. Mayakovsky often found himself engaged in confrontation with the increasing involvement of the Soviet State in cultural censorship and the development of the State doctrine of Socialist realism. Works that contained criticism or satire of aspects of the Soviet system, such as the poem “Talking With the Taxman About Poetry” (1926), and the plays The Bedbug (1929) and The Bathhouse (1929), were met with scorn by the Soviet state and literary establishment. Vladimir Vladimirovich Mayakovsky was born in Baghdati, Kutais Governorate, Georgia, then part of the Russian Empire, to Vladimir Konstantinovich Mayakovsky, a local forester, who belonged to a noble family and was a distant relative of the writer Grigory Danilevsky. Vladimir Vladimirovich’s mother Alexandra Alexeyevna (née Pavlenko), was a housewife, looking after the children, a son and two daughters, Olga and Lyudmila (their brother Konstantin died at the age of three). The family was of Russian and Zaporozhian Cossack descent on their father’s side and Ukrainian on their mother’s.At home the family spoke Russian. With his friends and at school Mayakovsky used Georgian. “I was born in the Caucasus, my father is a Cossack, my mother is Ukrainian. My mother tongue is Georgian. Thus three cultures are united in me,” he told the Prague newspaper Prager Presse in a 1927 interview.Georgia for Mayakovsky remained the eternal symbol of beauty. “I know, it’s nonsense, Eden and Paradise, but since people sang about them // It must have been Georgia, the joyful land, that those poets were having in mind”, he wrote later. In 1902 Mayakovsky joined the Kutais gymnasium where, as a 14-year-old he took part in socialist demonstrations at the town of Kutaisi. His mother, aware of his activities, apparently didn’t mind. “People around warned us we were giving a young boy too much freedom. But I saw him developing according to the new trends, sympathized with him and pandered to his aspirations,” she later remembered. After the sudden and premature death of his father in 1906 (he pricked his finger with a rusty pin while filing papers and died of blood poisoning) the family — Mayakovsky, his mother, and his two sisters — moved to Moscow after selling all their movable property. In July 1906 Mayakovsky joined the 4th form of the Moscow’s 5th Classic gymnasium and soon developed a passion for Marxist literature. “Never cared for fiction. For me it was philosophy, Hegel, natural sciences, but first and foremost, Marxism. There’d be no higher art for me than “The Foreword” by Marx,” he recalled in the 1920s in his autobiography I, Myself. In 1907 Mayakovsky became a member of his gymnasium’s underground Social Democrats’ circle, taking part in numerous activities of the Russian Social Democratic Labour Party which he, given the nickname “Comrade Konstantin”, joined the same year.In 1908, the boy was dismissed from the gymnasium because his mother was no longer able to afford the tuition fees. For two years he studied at the Stroganov School of Industrial Arts, where his sister Lyudmila had started her studies a few years earlier. As a young Bolshevik activist, Mayakovsky distributed propaganda leaflets, possessed a pistol without a license, and in 1909 got involved in smuggling female political activists out of prison. This resulted in a series of arrests and finally an 11-month imprisonment. It was in a solitary confinement of the Moscow Butyrka prison that Mayakovsky started writing verses for the first time.“Revolution and poetry got entangled in my head and became one,” he wrote in I, Myself As an underage person, Mayakovsky avoided a serious prison sentence (with subsequent deportation) and in January 1910 was released.A warden confiscated the young man’s notebook, and years later Mayakovsky conceded that was all for the better, yet he always cited 1909 as the year his literary career started. Upon his release from prison, Mayakovsky remained an ardent Socialist, but realized his own inadequacy as a serious revolutionary. Having left the Party (never to re-join it), he concentrated on education. “I stopped my Party activities. Sat down and started to learn… Now my intention was to make the Socialist art,” he later remembered. In 1911 Mayakovsky enrolled in the Moscow Art School. In September 1911 a brief encounter with fellow student David Burlyuk (which nearly ended with a fight) led to lasting friendship and had historic consequences for the nascent Russian Futurist movement. Mayakovsky became an active member (and soon a spokesman) for the group Hylaea (literature) ( ru ) (Гилея), which sought to free the arts from academic traditions: its members would read poetry on street corners, throw tea at their audiences, and make their public appearances an annoyance for the art establishment. Burlyuk, on having heard Mayakovsky’s verses, declared him “a genius poet”. Later Soviet researchers tried to downplay the significance of the fact, but even after their friendship ended and their ways parted, Mayakovsky continued to give credit to his mentor, referring to him as “my wonderful friend”. “It was Burlyuk who turned me into a poet. He read the French and the Germans to me. He pressed books on me. He would come and talk endlessly. He didn’t let me get away. 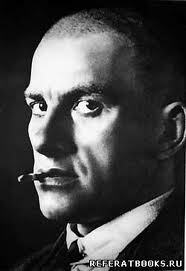 He would subside me with 50 kopeks each day so that I’d write and not be hungry,” Mayakovsky wrote in “I, Myself”.